Our acoutic research activities can be divided in two categories: estimating backscatter for any species of interest, and using backscatter models to examine and test assumptions of acoustic methodologies. Backscatter models allow us to quantify magnitudes and variances of reflected sound from individuals or aggregations of fish. We use backscatter predictions to create fish schools in attempts to improve acoustic survey techniques. The following pages can be perused as a tutorial using the forward and back arrows at the bottom right corner of each page, or viewed independently by topic. Some of the pages provide links to web based applications where you can create your own acoustic backscatter models. Have fun and let us know what you think! Backscatter Variability An examination of sources, magnitudes, and variability of backscattered sound from fish. Kirchhoff-ray mode Model A description of the structure and function of the KRM model used to predict echo amplitudes. Model Visualizations An interactive demonstration of fish morphology and model results. 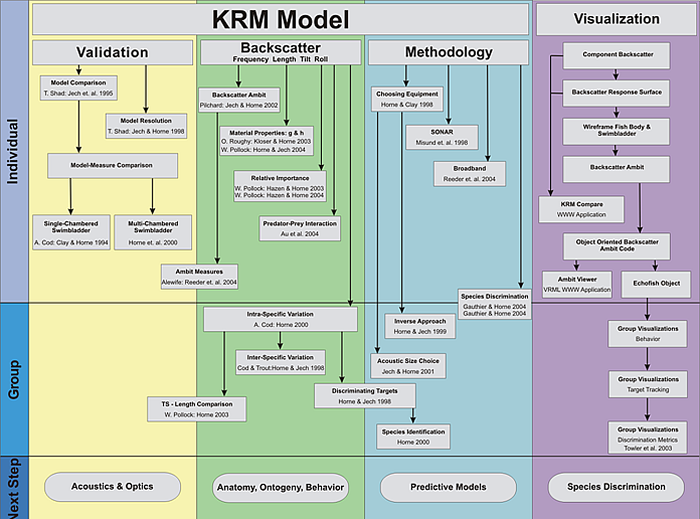 Model Applications Results from recent projects using KRM models.